The book is about the transformation of the intelligent, resilient Sophia Dennison into a super hero. "The First" opens with Sophia being taken away for lethal injection, but Sophia is not one to be held down by a deadly, toxic injection. The remainder of the book follows Sophia's life on the run to various locations. Kipjo Ewers writes very descriptively thoughout the book. He does a great job of evoking emotion. For instance, during the prison scenes, the writing is cold and matter-of-fact. The author has also put a lot of effort into making the characters feel real. The main character, Sophia is exciting to follow, and I really enjoyed seeing her work her way out of problems and explore her new powers. 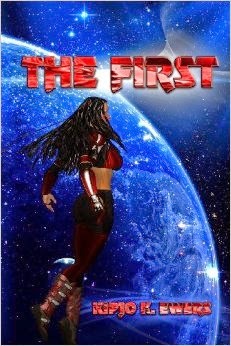 Overall, if you are a super hero fan, you will love the fresh super hero story in "The First."